Infinitely variable: 500 FPM (9 to 152 m/min), 10 HP Standard. Blade speed can be automatically set when material is selected. Standard 3-degree forward approach angle for increased efficiency in cutting of structural material. 20' 2" (6147 mm) long x 2" (51 mm) wide, .063" (1.6 mm). (One Welded-Edge Band is furnished with each machine as part of standard start-up supplies). Hydraulically controlled, 35,000 psi. max. (240 MPa). Machine equipped with automatic blade break/blade stall shut off switch. Hydraulically positioned and locking, controlled through the operator's touch screen. Hydraulic, full stroking with 24" (610mm) high x 7" (180mm) wide faceplates. Variable vise pressure comes standard with machine. Includes full capacity Hydraulic hold-down (Nesting Clamp) mounted next to the in-feed machine vise for vertical clamping of structural shapes or multiple bar work. Built-in with Flood and Automatic Mist Lubrication system (requires compressed air connection), including chip pan with manual hand crank type chip conveyor (optional power Chip Conveyor M8 is available). Washes away chips from hard-to-get-at places reducing clean-up time. The Automatic Bar Feed design features a 120" (3048mm) stroke length with indexing speeds of up to 55 ft/min. The bar feed vise is servo driven with encoder feedback, and combines heavy duty rack and gear drive with preloaded recirculating linear guides. The vise itself is hydraulically clamped to prevent material slippage. Optional second machine vise and/or Hold down is available (must specify right or left hand machine configuration at the time of order - Option Codes F8 & F4). Optional Remnant reduce is available, See option code PS4 Weight Capacity: 750lbs/ft (1,118kg/m). Total Capacity: 7,500 lbs (3,400kg). Provides a Programmable Logic Control Unit with an 8” color, touch screen display. The control features graphical part programming with memory for up to 500 jobs and parts, as well as a material selection chart and customizable material library. Both blade speed and feed force are automatically set according to material type for optimal cutting performance. Job programming consists of setting the cut-off length, and number of pieces to be cut. Additional features include Inch/Metric capability, out-of-stock shut down device, a fast cut job option and expanded memory storage using removable media. Also includes Jammed Blade Protection that senses resistance as the column returns and stops to prevent blade damage. 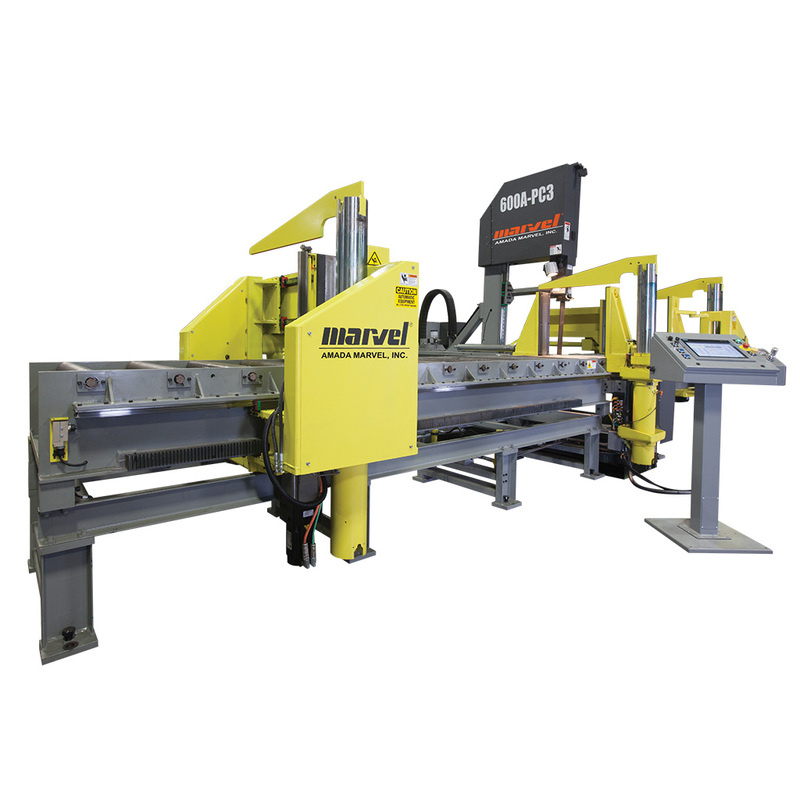 Material can also be fed through the machine manually in both directions using the hydraulic shuttle vise. Blade can be stopped with all other power functions operative. Main Drive: 10 H.P., 1800 RPM, totally enclosed, fan cooled, ball bearing. Coolant Pump: 1/8 H.P. (.1 kW), I.P. 54 Rating, totally enclosed motor built-in integrally. Hydraulic Pump: 5 H.P. (3.7 kW), 1800 RPM, totally enclosed fan cooled, ball bearing, system pressure 900 psi (6.2 MPa). IEC fused disconnect switch and magnetic motor starters with overload and low-voltage protection. Power supply provides low voltage (24 volts DC) control to all push buttons at operator's control panel and machine lighting circuits. PLC control and drives mounted in vented compartment with vibration isolation mountings. Electrical Equipment conforms to NFPA 79-2015. The Electrical Control Panel is UL 508A listed. For clamping work on both sides of the blade, permitting trim cuts on both ends of the work piece. Includes hydraulic cylinder, front and rear jaw and fittings. Indicate Left or Right configuration. For use only when not ordering the remnant reducer. (Nest clamp) mounted on the discharge side of the blade. For vertical clamping of structural shapes, or multiple bar work. Works with or without the F4 and only available when not ordering the remnant reducer. Add for visual alignment of the point of cut to the blade. For clamping work on the discharge side of the machine, permitting zero remnant and remnant reduction. Features a 48” (1220mm) stroke length with indexing speeds up to 40 ft/min. The remnant reduction vise is servo driven with encoder feedback, and combines a precision ball screw with preloaded recirculating linear guides. Indicate Left or Right configuration. Weight Capacity: 750lbs/ft (1,118kg/m). Total Capacity: 7,500 lbs (3,400kg). Three Ball Bearing Idler Rollers, 3.5” diameter, spaced on 20” centers; (3 Flush Plates, Discharge side only), and Coolant Pan. Six Ball Bearing Idler Rollers, 3.5” diameter, spaced on 20” centers; (6 Flush Plates, Discharge side only), and Coolant Pan. Six powered Ball Bearing rollers, 4.5” diameter, spaced on 20” centers; 6 Flush Plates (Discharge side only), and Coolant Pan. Controls located at operator’s station. Includes Work-Lift Roller on machine bed (live on discharge side); also includes machine modification to supply drives and controls to power Live Rollers. Indicate Left or Right, Entry or Discharge configuration. Three powered Ball Bearing rollers, 4.5” diameter mounted in cast iron pillow blocks on 20” centers, Coolant Pan, no Flush Plates. Six powered Ball Bearing rollers, 4.5” diameter, mounted in cast iron pillow blocks on 20” centers, Coolant Pan, no Flush Plates.